What Is an Internal Regulator of the Cell Cycle? What Happens to a Cell If It Does Not Copy DNA Chromosomes Before It Divides? What Happens in the Interphase of the Cell Cycle? 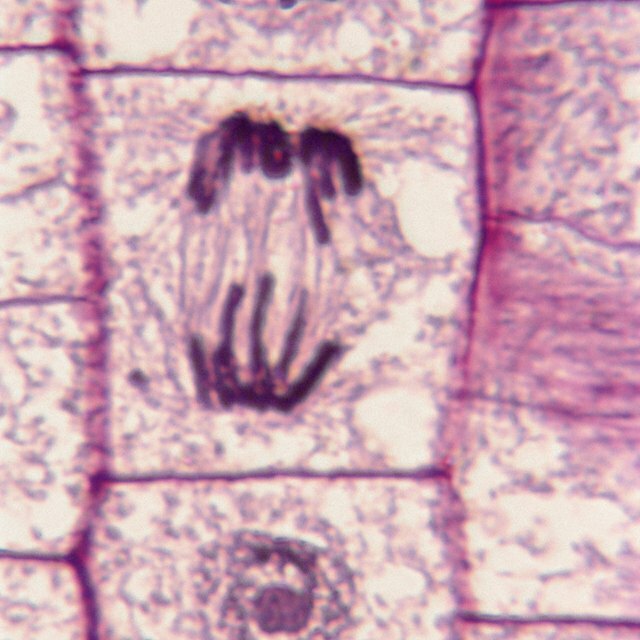 Scientists first observed the process of cell division in the late 1800s. The consistent microscopic evidence of cells expending energy and material to copy and divide themselves disproved the widespread theory that new cells arose from spontaneous generation. Scientists were beginning to understand the phenomenon of the cell cycle; this is the process by which cells are "born" through cell division, and then live their lives, going about their daily cell activities, until it's time to undergo cell division themselves. Plenty of reasons why a cell might not go through a division exist. Some cells in the human body simply do not; for example, most nerve cells eventually stop undergoing cell division, which is why a person who endures nerve damage might suffer permanent motor or sensory deficits. Typically, though, the cell cycle is a process that consists of two phases: interphase and mitosis. Mitosis is the part of the cell cycle that involves cell division, but the average cell spends 90 percent of its life in interphase, which simply means the cell is living and growing and not dividing. There are three subphases within interphase. These are G1 phase, S phase, and G2 phase. The three stages of interphase are G1, which stands for Gap phase 1; S phase, which stands for Synthesis phase; and G2, which stands for Gap phase 2. Interphase is the first of two phases of the eukaryotic cell cycle. The second phase is mitosis, or M phase, which is when cell division occurs. Sometimes cells do not leave G1 because they are not the type of cells that are dividing, or because they are dying. In these cases, they are in a stage called G0, which is not considered part of the cell cycle. Single-celled organisms such as bacteria are called prokaryotes, and when they engage in cell division, their purpose is to reproduce asexually; they are creating offspring. Prokaryotic cell division is called binary fission instead of mitosis. Prokaryotes typically only have one chromosome that is not even contained by a nuclear membrane, and they lack the organelles that other kinds of cells have. During binary fission, a prokaryotic cell makes a copy of its chromosome, and then attaches each sister copy of the chromosome to an opposing side of its cell membrane. It then begins to form a cleft in its membrane that pinches inward in a process called invagination, until it separates into two identical, separate cells. The cells that are part of the mitotic cell cycle are the eukaryotic cells. They are not individual living organisms, but cells that exist as cooperating units of larger organisms. The cells in your eyes or your bones, or the cells in your cat's tongue or in the blades of grass on your front lawn are all eukaryotic cells. They contain much more genetic material than a prokaryote, so the process of cell division is also much more complex. The cell cycle got its name because cells are constantly dividing, beginning life anew. Once a cell divides, that is the end of the mitosis phase, and it immediately starts interphase again. Of course, in practice, the cell cycle happens fluidly, but scientists have demarcated phases and subphases within the process in order to better comprehend the microscopic building blocks of life. The newly divided cell, which is now one of two cells that were previously a single cell, is in the G1 subphase of interphase. G1 is an abbreviation for the “Gap” phase; there will be another one labeled G2. You may also see these written as G1 and G2. When scientists discovered the busy, fundamental cellular work of mitosis under the microscope, they interpreted the relatively less dramatic interphase to be a resting, or pausing phase between cell divisions. They named G1 stage with the word “gap” using this interpretation, but in that sense, it is a misnomer. In reality, G1 is more a stage of growth than a stage of rest. During this phase, the cell is doing all of the things that are normal for its type of cell. If it is a white blood cell, it will be performing defensive actions for the immune system. If it is a leaf cell in a plant, it will be performing photosynthesis and gas exchange. The cell is likely to be growing. Some cells grow slowly during G1 while others grow very rapidly. The cell synthesizes molecules, such as ribonucleic acid (RNA) and various proteins. At a certain point late in the G1 stage, the cell has to “decide” whether or not to move on to the next stage of interphase. A molecule called cyclin-dependent kinase (CDK) regulates the cell cycle. This regulation is necessary to prevent a loss of control of cell growth. Out-of-control cell division in animals is another way of describing a malignant tumor, or cancer. CDK provides signals at checkpoints during specific points of the cell cycle for the cell to proceed, or to pause. Certain environmental factors contribute to whether CDK provides these signals. These include the availability of nutrients and growth factors, and the cell density in the surrounding tissue. Cell density is a particularly important method of self-regulation used by cells to maintain healthy tissue growth rates. CDK regulates the cell cycle during the three stages of interphase, as well as during mitosis (which is also called M phase). If a cell reaches a regulatory checkpoint and does not receive a signal to continue forward with the cell cycle (for example, if it is at the end of G1 in interphase and is waiting to enter S phase in interphase), there are two possible things that the cell could do. One is that it could pause while the problem is solved. If, for example, some necessary component is damaged or missing, repairs or supplementation could be made, and then it could approach the checkpoint again. The other option for the cell is to enter a different phase called G0, which is outside of the cell cycle. This designation is for cells which will continue to function the way they are supposed to, but will not move on to S phase or mitosis, and as such, will not engage in cell division. Most adult human nerve cells are considered to be in the G0 phase, since they typically do not proceed to S phase or mitosis. 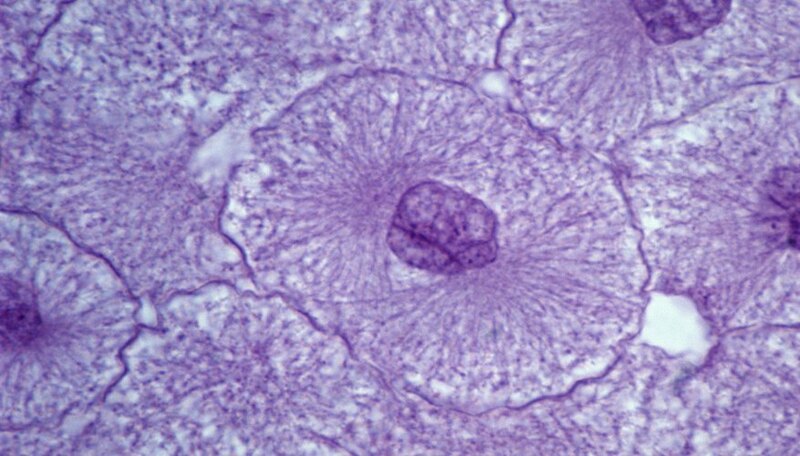 Cells in the G0 phase are considered to be quiescent, meaning that they are in a non-dividing state, or senescent, meaning that they are dying. During the G1 stage of interphase, there are two regulatory checkpoints the cell must pass through before proceeding. One assesses whether the cell’s DNA is damaged, and if it is, the DNA must be repaired before it can proceed. Even when the cell is otherwise ready to proceed to the S phase of interphase, there is another checkpoint to make sure that environmental conditions – meaning the state of the environment immediately surrounding the cell – are favorable. These conditions include the cell density of the surrounding tissue. When the cell has the necessary conditions to proceed from G1 to S phase, a cyclin protein binds to CDK, exposing the active part of the molecule, which signals to the cell that it is time to begin S phase. If the cell does not meet the conditions to move from G1 to S phase, the cyclin will not activate the CDK, which will prevent the progression. In some cases, such as damaged DNA, CDK-inhibitor proteins will bind to CDK-cyclin molecules to prevent progression until the problem is remedied. To add to the complicated movements happening during DNA replication, many eukaryotic cells are diploid, which means that their chromosomes are normally arranged in pairs. Most human cells are diploid, with the exception of the reproductive cells; these include oocytes (eggs) and spermatocytes (sperm), which are haploid and have 23 chromosomes. Human somatic cells, which are all of the other cells in the body, have 46 chromosomes, arranged in 23 pairs. The paired chromosomes are called a homologous pair. During the S phase of interphase, when each individual chromosome from an original homologous pair is replicated, the resulting two sister chromatids from each original chromosome are joined, forming a figure that looks like two X’s glued together. During mitosis, the nucleus will split into two new nuclei, pulling one of each chromatid from each homologous pair away from its sister. If the cell passes the S phase checkpoints, which are especially concerned with making sure that the DNA was not damaged, that it replicated correctly and that it replicated only once, then regulatory factors allow the cell to proceed into the next stage of interphase. This is G2, which stands for Gap phase 2, like G1. It is also a misnomer, as the cell is not waiting, but is very busy during this stage. The cell continues to do its normal work. Recall those examples from G1 of a leaf cell performing photosynthesis or a white blood cell defending the body against pathogens. It also prepares to leave interphase and enter mitosis (M phase), which is the second and final stage of the cell cycle, before it divides and begins all over again. Another checkpoint during G2 ensures that the DNA was replicated correctly, and CDK allows it to move forward only if it passes muster. During G2, the cell replicates the centromere that binds the chromatids, forming something called a microtubule. This will become part of the spindle, which is a network of fibers that will guide the sister chromatids away from each other and to their proper places in the newly divided nuclei. During this phase, mitochondria and chloroplasts also divide, when they are present in the cell. When the cell has surpassed its checkpoints, it is ready for mitosis and has finished the three stages of interphase. During mitosis, the nucleus will divide into two nuclei, and at almost the same time, a process called cytokinesis will divide the cytoplasm, meaning the rest of the cell, into two cells. By the end of these processes, there will be two new cells, ready to begin the G1 stage of interphase again. What Are the Characteristics of a Cell Undergoing Interphase? What Are the Two Main Stages of the Cell Cycle? What Happens During the G1 Phase? Epstein, Rebecca. "3 Stages of Interphase." Sciencing, https://sciencing.com/3-stages-interphase-11915.html. 31 August 2018.